New York City (November 17th 2016, 12:01 AM GMT+1) - There’s no annual wine tradition quite like the November release of Georges Duboeuf Beaujolais Nouveau, and wine lovers around the world collectively rejoice as the 2016 bottling is officially released today - the third Thursday of November, at 12:01am GMT+1 (Beaujolais time). Beaujolais Nouveau symbolizes the end of the harvest season and represents an invitation to partakeof autumn’s bounty. The French have always enjoyed Nouveau as a sentimental wine to drink this time of year among family and friends - a reason to get together at the table in November when harvest is done, the weather is gray and the days are short. Since Georges Duboeuf first brought Nouveau to the U.S. in 1982, American wine lovers have come to mark its festive release as the unofficial harbinger of the holiday season, while associating its harmonious flavors as the perfect marriage for a Thanksgiving feast. No other wine is released annually with such pomp, made and released as a finished wine in only six to eight weeks after harvest to literally put a cork in the end of the growing season. 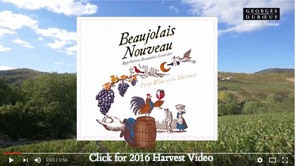 Beaujolais Nouveau represents the classic incarnation of the “harvest wine” tradition as it has been practiced for centuries in France, and this year’s label captures that spirit with its fanciful presentation of its signature Gamay grape’s journey – first from vine to bottle, and then off to wine lovers around the world. The label also represents the first ever consumer-chosen label for Georges Duboeuf Nouveau – a process that was conducted entirely over social media (also unprecedented for the brand). What started as a competition among French wine distributors to deliver the first Beaujolais Nouveau to Paris has grown into a worldwide celebration. Released after the stroke of midnight on the third Thursday in November per French law, Beaujolais Nouveau is a bright, fresh red wine made from the Gamay grape. The 2016 Georges Duboeuf Beaujolais Nouveau is 100% hand-harvested, using traditional vinification methods that include carbonic maceration. The estate released a 2016 harvest video to commemorate the vintage. To celebrate this year’s Beaujolais Nouveau Day, second generation proprietor Franck Duboeuf will tonight uncork some of the first bottles at New York City’s Bouley Botanical, at a dinner prepared by Chef Daniel Eddy of Rebelle in NYC and formerly of Spring (among the most coveted reservation in Paris). Georges Duboeuf has also partnered with hundreds of wine bars and restaurants around the country that are celebrating the arrival of Beaujolais Nouveau, as well as harvest-themed parties thrown by the French-American Chamber of Commerce in cities including New York, Chicago, Washington, D.C., New Orleans, Houston, San Francisco, and Seattle among others. To find a Beaujolais Nouveau party near you, visit www.faccwinefestivals.com. Retailing at $11.99 nationwide, the 2016 Georges Duboeuf Beaujolais Nouveau complements an abundance of holiday dishes, from savory roasts to cranberry sauce, with all its fresh aromas of red and black fruits, strawberry jam and hints of white peach on the nose. It is fresh, fruit-forward and flavorful on the palate with a deliciously satisfying finish. It is best served slightly chilled, between 62°F - 66°F, which is just slightly cooler than room temperature, to enhance the aromas and fruit flavors. The region of Beaujolais’ deep, granitic soils are responsible for granting its Nouveau wines such immediately gratifying generosity of fruit, and the 2016 vintage saw near-perfect summer growing conditions. The ideal hot and dry crescendo to harvest enabled the resulting wines to exude what has been called a perfect combination of freshness and lively fruit character. For more information about Georges Duboeuf Beaujolais Nouveau, visit http://www.duboeuf.com/ or www.facebook.com/GeorgesDuboeuf. Georges Duboeuf is a premium producer of award-winning French wines from the Beaujolais and Mâconnais regions of Burgundy and the South of France. Georges Duboeuf is the #1 selling brand of Beaujolais in the world and the world’s highest scoring French wine brand under $20, according to Wine Advocate (2009-2013). Georges Duboeuf’s love affair with Beaujolais is no secret. His legendary palate, his ability to spot great wine and his enthusiasm continue to make him an emblematic figure in the wine industry. The wines Les Vins Georges Duboeuf bring to market are renowned for their consistency, quality and value. Georges Duboeuf currently works closely with hundreds of wine growers (over 400 in the Beaujolais region alone) to ensure the highest quality fruit from each region. They are sold in 120 countries throughout the world. Les Vins Georges Duboeuf are imported by Quintessential Wines, based in Napa, California. Founded in 2002 by father and son, Stephen D. and Dennis Kreps, Quintessential is a family owned-and-operated import, marketing and sales company headquartered in Napa, CA. It is dedicated exclusively to representing multi-generational, family owned-and-operated producers who have the same passion for winemaking as Quintessential has in strategically marketing and selling their wines. These producers, from most of the top wine regions around the world, create wines that offer the best, most authentic expression of the grapes from their respective vineyards. For press inquiries, images and samples please contact Kimberly Noelle Charles or Alexandra Fondren at Charles Communications Associates at press@charlescomm.com or 415.701.9463.